New Nextel Blackberry for Mid-Sized Markets | BlackBerry Blast! 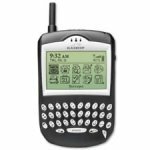 Nextel Partners, Inc. and Research In Motion announced plans to expand distribution of the new BlackBerry 6510 Wireless Handheld™. Nextel Partners will now offer BlackBerry in the mid-sized markets it exclusively serves with Nextel's integrated wireless solutions. Available today, it is the only BlackBerry™ handheld on the market featuring Nextel Direct Connect®, the powerful long-range digital walkie-talkie feature, while incorporating a phone, organizer and "always-on" wireless access to business e-mail and data, all in one device. The BlackBerry platform is especially beneficial for mobile employees who need tools to stay productive while away from their office. Field sales representatives, for instance, who make up 34 percent of all mobile workers according to the Yankee Group, can use BlackBerry to stay better connected to their clients and colleagues. What's more, businesses can easily develop custom and cost-effective applications for their mobile employees that will increase efficiency and productivity. "Expansion of Nextel Partners' product line reinforces our long-standing commitment to business customers and dedication to 100 percent customer satisfaction," said John Chapple, Nextel Partners' CEO and Chairman. "Convergence isn't the future, it is here today. The BlackBerry 6510 not only offers wireless e-mail and the full functionality of an organizer, but the all-in-one connectivity of Nextel that has helped attract the most loyal customer base in the industry."